Her first job was assembling transistor radios in a Chinese forced labour factory in Nanjing. She was serving the Party, reluctantly helping millions of agricultural workers listen to Chairman Mao’s broadcasts every morning. On her first day, the barely teenage Ping Fu assembled 30 units. But she had failed to connect the volume terminal and so none of them worked. But such was her aptitude for technology that she graduated to speedometers and by the time she was 18, after serving a stint in the military, she had risen to the rank of electrical engineer. When not working at the factory she read banned copies of Gone With the Wind as well as Pride and Prejudice. If caught with such proscribed texts she ran the risk of being executed. But, separated from her family, Ping Fu was ambivalent about survival. She’d been gang raped by the Red Army when she was only 10. Today, Ping Fu is President and CEO of Geomagic, a company that reshapes the world, from personalising prosthetic limbs to fixing NASA spaceships. She is also one of only three ‘minority women’ running a Fortune 500 company. 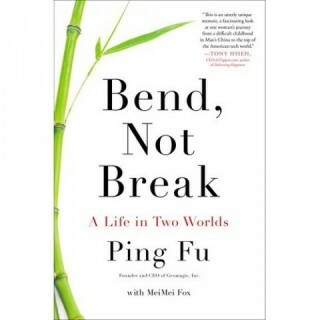 How she escaped China and became the embodiment of the American Dream is the subject of her new book, ‘Bend, Not Break.’ Honoured by President Obama, Ping Fu has reason to feel that ascendency into the corporate stratosphere might entitle her to feel that her life has been a triumph of resourcefulness over adversity. But, as her book illustrates, crossing cultures can be fraught, while life can sometimes be defined as much by what is left behind as what lies ahead. Bend, Not Break is a book that tells two stories about two separate worlds. On the one hand there is the trauma of growing up during the dawn of China’s Cultural Revolution. On the other, there is the tale of how she became a leading light in the Internet revolution in the US. There is also a journey between imprisonment and freedom, from the draconian anti-capitalism of Mao’s repressive regime to the vaulting ambition of the world of technology start-ups and the dot-com bubble. Able to cope with, and survive, these extremes she is often mystified by both and as a result Ping Fu is at her most illuminating when writing about clashes of cultural identities. As she gets closer to receiving her US citizenship she realises she has never felt more Chinese. When in 1993 she finally returns from exile to be reunited with her families (she was adopted, but recognises both her Shanghai and Nanjing parents) she realises that post communist China is every bit as grotesque as it was under Mao. A life such as Ping Fu’s would be enough to break anyone. But as her title suggests, like the bamboo of her birth country she has learned to develop an amazing capacity for bending with the wind. ‘If you want to get anything done here you’ve got to stop thinking like an American CEO’ says Greg Carr, looking out over a small car park where field scientists, engineers and biologists are packing up their Land Rovers in the early morning African sun. Carr was one of the most influential American CEOs during the digital technology revolution of the 1980s. And the rewards were substantial as he amassed a colossal personal fortune. But here in the middle of Mozambique – the world’s poorest country – he has no Croesus-like delusions of grandeur, while pioneering telecommunications is a world away. There are no power trips, status symbols or trivial luxury. ‘If you look at the organisation chart, you’ll see I’m not even the boss’ he says, before explaining that what he does now, in partnership with the Government of Mozambique, this is his most rewarding challenge to date. And it’s made him a national hero. Having once made a living from hacking through the lianas and creepers of the corporate jungle, he’s now dedicated his professional life to restoring a real jungle – Mozambique’s Gorongosa National Park. His aim is to return to Mozambique its ‘crown jewel’ in pristine condition, and in doing so provide sustainable employment, education and health for local people whose economy has been destroyed by civil war. Understandably, for the village people of this rarely visited country his new career is far more important. Well known for his championing of humanitarian causes, Carr has signed a deal with the government in a ‘classic public private partnership’ that sees US$40 million of his own money ploughed straight into the project. Both parties hope that in 20 years time the Park will be a self-sufficient business that will put much needed economic activity into the country’s tourism sector with benefits for all. With the project still in its early phases, local people living around the Park have started to benefit from Carr’s corporate acumen. They now have jobs. And Carr has helped provide the local village of Vinho with water pumps, medical facilities and a school. But it’s only the start. ‘We need 750 medical centres’, he says referring to the other villages surrounding the National Park. Carr is best known in the world of digital communications as one of the protagonists in the emergence of voice mail, a technology that informs so much of our everyday business and social lives that, as with other basics such as email, we never really stop to consider the engineering behind it. But the story goes that, inspired by the breakup of AT&T, he founded Boston Technology, one of the earliest organisations to market voice mail systems to telephone companies. Carr served as the chair of Boston until Comverse Technology bought it out. He went on to become chair of Prodigy, an early global Internet service provider. These were good breaks for Carr and by 1998 he retired from ‘for-profit’ business an extraordinarily wealthy man and made entrepreneurial philanthropy his full-time job. Today he spends half of his life in Mozambique, and as he describes his new job it’s clear that, while success in the world of digital technology was a major milestone in his career, it’s what comes after financial success that really matters. ‘I’m a human rights guy’ he says just in case you might be thinking he’s still a hotshot CEO. What you really have to do is listen to what the people want. So what did they want? ‘Bicycles’ he says. That was the most important thing for almost everyone. As the employees took home their first wage packets from the restored Chitengo Lodge, most of them invested in a set of wheels. It changed their lives. In the 1960s Chitengo was a hip hangout for cool and trendy (and very rich) South Africans who wanted to go into the bush to see elephants and lions at close range. Businessmen in their smart new Mercedes-Benzes drove up in, well droves, to visit a National Park that had arguably the densest population of mega fauna – lions, elephants, wildebeest – that Africa had ever seen. But when the Civil War rolled in, Chitengo became popular for a different reason. Strategically placed on the Beira Corridor that links the Indian Ocean seaboard with Zimbabwe, it was also the only brick-built permanent settlement for miles around. The competing political factions Renamo and Frelimo were fighting one of the bloodiest battles seen in this part of Africa. They both wanted Chitengo as a military stronghold. Before long, or so it seemed, all the animals were dead and Chitengo was just another war-blasted ghost town. Meanwhile the war killed a million humans. There’s still plenty of evidence of the war today. As Carr and I walk around the lodge he shows me bullet holes in the walls and gates, grenade damage to the water towers, while the path we take to the ferry to the nearest village Vinho threads its way through a cleared minefield. Cleared or not, you don’t stray from the path – just outside the chicken-wire fence enclosing the compound there’s a post close to buildings that were once used for interrogation. It’s riddled with head-height bullet holes. For the visitor the most pressing question is that of where the animals have gone. Although there are lions and elephants today they’re present in nothing like their former numbers. ‘There have been two wars – civil conflicts – here in Mozambique in recent times’ says Carr. ‘The first, the War of Independence, didn’t affect the ecosystem that much. Mozambique got its independence from Portugal in 1974. And so the National Park in the late Seventies was in good shape.’ But then followed a civil war between the resistance movement Renamo and the liberation movement Frelimo. ‘That really got going in the Eighties, and there were battles fought here at Chitengo, and it changed hands a couple of times. The camp was shut down to tourism as it was occupied by the militia.’ He tells me of a local ranger working at one of the local who was held prisoner in that swimming pool. He is currently serving under Yale’s World Fellows Program for 2009 that aims to broaden and strengthen the leadership skills of emerging leaders as they work on progressing thinking on global issues and challenges. Jarvis has co-written a course for the Open University on environmental management. The course will be linked in with the BBC’s Frozen Planet series due to be broadcast in 2011. If that weren’t enough, his immediate plans include the recreation of legendary explorer Ernest Shackleton’s ‘Boy’s Own’ voyage of heroism from Elephant Island to South Georgia in replica of the original open whaler, the James Caird. Tim Jarvis: Last year I was project manager and technical peer reviewer of Environmental/Social Impact Assessments for a number of large open cast iron ore mines in Sweden and Finland. These were situated in sensitive locations adjacent to human populations and sensitive river and wetland environments. I was responsible for developing various extraction, waste disposal and rehabilitation options. TJ: I normally speak about the lessons I have learnt related to problem solving, teamwork, change management and goal setting with perhaps a little bit of cannibalism thrown in. After a decade of polar travel, and almost twice that long working as an environmental scientist, I also talk about topics related to human-induced environmental change and how industrial and domestic consumers can reduce our environmental impacts. I also look at the associated opportunities and costs, how to manage change in our personal lives, as well as at a corporate level. E&T: How do you think that your role as explorer helps cast light on this? TJ: I provide first-hand information on the fascinating regions in which I have travelled and worked, with expedition analogies offering insights into the parallels in the business world. I think my expeditions provide motivation for those looking to embark on the process of achieving their personal and professional goals, set against a topical background of polar ice cap melt and an ever more interconnected world. E&T: As an engineer and an explorer, are there any conflicts of interest? TJ: No. The expeditions I do involve going to remote places of high environmental and wilderness value. This gives me the chance to highlight their value in the books, films and articles produced. This allows me to draw to the wider public’s attention any environmental change I observe in the regions I visit. E&T: Do you feel that expeditions are in some ways businesses in microcosm? TJ: The whole process of planning expeditions is an exercise in business planning: determining an original concept and an understanding of whether a niche exists for it in the marketplace; what level of support there might be for it; taking it through to marketing, planning, risk assessing and costing all aspects. These are all parts of the process of project management. Expeditions can demonstrate and highlight areas of business execution, including problem solving, teamwork and so on. Typically, the talks I deliver focus on the parallels that exist between extreme expeditions and running a business. E&T: Who was Douglas Mawson and why did you recreate his sledging epic? TJ: Douglas Mawson was a scientist, geologist, explorer and industrialist. He accompanied Shackleton on his Nimrod expedition, when he famously trekked to the South Magnetic Pole. I retraced Mawson’s subsequent journey – his famous survival journey of 1912/13 in which two of his colleagues died. The modern expedition used the same clothing, equipment and starvation rations as Mawson to allow us to test various theories about what had happened. At the time many believed that Mawson had been forced into cannibalism in order to survive. E&T: What conclusions did you draw that are transferrable to business/engineering? TJ: I learnt a lot about how difficult it is to conduct al forms of business the old way. But I learned to make the best with what I have – old, often unreliable gear and starvation rations – and work towards more manageable goals when bigger, more optimistic goals are not possible. I planned and risk managed accordingly to cope with these eventualities. Operating with limited resources has good parallels with the corporate world in that business often has to make do with budgetary and resource constraints and plan accordingly (although often fails to do this). E&T: The Heroic Age of Antarctic Exploration is almost a century behind us now. Why do we keep going back to it – and in particular Shackleton – for our leadership lessons? TJ: Shackleton had many characteristics that made him a phenomenal leader –charisma, fund-raising ability and general empathy with people. He was brilliant at managing change, and ensuring that his team really worked as a team. In terms of everyone pulling together, he was very inclusive, being careful not to isolate anyone and was prepared to muck-in with the men. He also broke down the very real class divides that existed amongst his men. E&T: What do you think was his key leadership characteristic? TJ: Shackleton’s ability to change direction was a key strength too. Once the South Pole had been reached by Amundsen Shackleton saw that he must switch his goal to crossing the whole of Antarctica on the Imperial Trans-Antarctic expedition. His esteem, reputation and legacy were all wrapped up in this one trip. But then with the sinking of his ship Endurance he was forced to re-evaluate his goals once more and, despite his desperate disappointment he pursued the new goal of getting his entire crew home safely with the same dedication and determination (see box ‘recreating the voyage of the James Caird’). This showed tremendous presence of mind and a great leader who not only recognised the original goal is no longer achievable, but is prepared to act unequivocally on the new goal. This is a valid message for the changed world in which we find ourselves post-credit crunch, where financial plans of a year ago are no longer viable and we need to re-set goals and pursue them with the same vigour as the now unachievable goals of a year ago. Explorer Tim Jarvis uses his expeditions to communicate positive leadership and self-development messages. His next major expedition will be an attempt to retrace Ernest Shackleton’s journey in the James Caird from Elephant Island to South Georgia. This is often cited as one of the greatest rescue missions in the history of exploration: Shackleton, with a handful of men set forth in a plucky little open top whaler of just 23ft traversing 800 miles of the most hostile seas in the world. As a result of Shackleton’s leadership the mission was a success, and to this day the great man’s leadership style is still central to curricula at many business schools. Whether it be looking at environmental issues such as climate change, or the state of disarray in the credit markets, Shackleton’s message of individuals putting differences aside and working to their strengths to collectively overcome seemingly insurmountable problems has real resonance. The expedition will start from the Antarctic Peninsula, where much of Antarctica’s ice cap melt has occurred, several hundred kilometres from the infamous Larsen B Ice Shelf. The expedition aims to document the status of Antarctic ice with Jarvis in his role as environmental scientist. The expedition will set sail from Elephant Island at the end of the austral summer 2011 in a replica of the James Caird and, in an attempt to relive Shackleton’s experience, will use only technology, food and equipment that he would have had available in 1916. The Shackleton Epic Expedition is seeking sponsorship support from both corporate sponsors and individuals to assist with funding the expedition. A breakdown of expedition costs and opportunities associated with sponsorship can be obtained by contacting Tim Jarvis (via http://www.timjarvis.org). Opportunities include wide international media exposure, and presentations to staff and clients of sponsoring organisations. Costs relate mainly to logistical support, clothing and equipment, the construction of the replica James Caird boat, and transport of the expedition team. I’m standing on the bridge of the world’s largest and most powerful nuclear icebreaker. It’s been days since we’ve seen land and even longer since we’ve seen anything approaching darkness. Here in the high latitudes in summer it never gets dark, and in the eerie silent fog, the Arctic seems like the loneliest place on earth. My GPS says we’re at 89° 59 999’N, which means we’re about as close as we can get to the North Pole without actually being there. In fact, given the size of the 50 Years of Victory – 159.6 metres long, with a breadth of 30metres – it’s perfectly possible that part it is already at the Pole. Of course, it doesn’t matter what my GPS says – not because of any possible margin of error – but because the only navigational reading that counts is the one on the bridge. We’re only technically at the Pole when Captain Dmitry Lobusov of the ‘50 лет Победы’ says we are. Positioning a 23,439 tonne ship on such a precise point as 90 degrees North, while simultaneously smashing through a pan of multiyear ice several metres thick, is a tricky job. Captain Lobusov has until now operated an ‘open bridge’, but we’ve been temporarily invited to leave to allow his crew some breathing space, to concentrate on this moment of pinpoint navigation. I leave reluctantly because the tension is mounting and it’s obvious that the precision of the final phase of the navigation is a matter of extreme seriousness. This is the world’s largest nuclear icebreaker and we’re going to stop it on a sixpence. And the Victory truly is huge. For all the facts and figures (see side panel ‘Specification Sheet’), nothing can really prepare you for the experience of simply being aboard this huge work of engineering art. Of course, compared with some of the commercial ocean going cruise liners such as the Independence of the Seas (which is twice as long) the Victory is a big minnow. But the idea of being aboard a ship powered by two nuclear reactors that’s going to blast its way through the ice to the Pole is simply awe-inspiring. To think that even in the heaviest of icebreaking conditions the Victory consumes only 200g of nuclear fuel per day – about the weight of an apple – borders on science fiction. It’s getting on for midnight on 15th July 2009 and after several attempts to ram a pan of multiyear ice out of our way, the icebreaker finally moves into position. ‘Ladies and Gentleman’ says an excited voice on the ship’s PA system, ‘we have achieved our expedition’s objective.’ The ship’s GPS reads 90° 00 000’ N (and for the record 172° 51 811’ E, although that hardly matters) and so it’s official – we’ve finally arrived at the Geographic North Pole. Most of the ship’s 124 passengers gather on the bow deck to celebrate, while the crew sets about the business of parking the ship (‘park’ is the technical term for mooring an icebreaker). Preparations are made for a party out on the ice at a ceremonial pole the following day. As the engines stop and the relentless vibration subsides it’s a great feeling to think we’ll be walking on the ice tomorrow. It’s hard to imagine what the great explorers of the past would have made of all this. Technology has advanced so far in the pat century that a feat of navigation that was once only the dream of visionaries and madmen is now a reality for adventure tourists. In 1909 no one had set foot at the North Pole for certain – Commander Robert Peary of the US Navy claimed to have arrived there with a team of dogs that year – and it was to be another 60 years before British Explorer Wally Herbert could claim to be the first human to have beyond all doubt arrived at the Pole on foot. The challenges for these pioneering explorers were enormous: apart from the constant battle with 5-metre high pressure ridges and ‘leads’ (rivers of open water), there was the gnawing sub-zero temperatures, ravenous polar bears and the intellectual rigours of navigation with compasses, wristwatches and the stars (on the rare occasions when the sky was clear or dark enough). It was a mind-bogglingly tough existence that these men chose, and one that’s hard for the passengers of the Victory to understand. A new day doesn’t dawn, but the clock tells us that it’s another day, and so on 16th July the ceremonies begin and I celebrate being the 22,500th person to set foot on the ice at the North Pole. This figure was calculated for me by onboard polar historian Robert Keith Headland, formerly archivist of the Scott Polar Research Institute, who has kept meticulous records of every arrival – and even disputed arrival – since Peary claimed to have attained ninety degrees north. As you stand with your feet on what T.S.Eliot called the ‘still point of the turning world’ the significance of this place slowly sinks in. Look directly upwards along the earth’s rotational axis you’ll come to Polaris, the North Star, the so-called celestial pole. Look down and beneath your feet after a couple of metres of sea ice, there are 4,000 metres of sea. Then, after 14,000km of planet, you’ll reach sea level at the South Pole, after which there are then another few hundred metres of rock, followed by 2,835 metres of ice. If you’ve maintained a straight line down through the globe you will end up almost in the middle of the geodesic dome of the Amundsen-Scott science research base at the South Pole. Captain Lobusov explained how the development of nuclear technology has led to icebreakers of increasing power and range, with the ability to remain at sea for long periods without refueling. In the Arctic summer, when the atomic fleet is less in demand for keeping open commercial seaways, icebreakers such as the Victory and her sister ship Yamal become available to adventure tourism companies such as Quark Expeditions, who commission these ships in order to make the armchair explorer’s dream of going to the North Pole a reality. Ten nuclear powered surface ships have been built in Russia, nine of which are icebreakers, with the tenth a container ship with icebreaking capabilities. And although the specifications differ from one to another, those in the Arktika class – of which the Victory is the newest member –are fundamentally the same, becoming more efficient, powerful or faster as evolving technology allows for higher performance. Power for the Victory is supplied by two pressurised water KLT-40 nuclear reactors, each containing 245 enriched uranium fuel rods. Each reactor weighs 160 tonnes and is enclosed in a reinforced compartment. Fifty kilos of uranium isotopes are contained in each reactor when fully fuelled, with a daily consumption of approximately 200g a day of heavy isotopes when breaking thick ice. This means that the Victory can remain operational for four years between changes of the reactor rods, Used cores are extracted and new ones installed in Murmansk, where spent fuel is reprocessed and waste is disposed of at a nuclear waste plant. A total of 86 sensors distributed throughout the vessel monitor ambient radiation. While on my way to the North Pole I was taken around the engine and control rooms, shown the nuclear reactors and I spoke to several of the officers in charge of keeping the Victory moving. Of course, you’re not allowed to photograph everything, but the Russians are far more open about showing you the technology of this ship that perhaps might be expected. After spending a day at the Pole it’s time to turn around and sail back to the Victory’s base at Atomflot in Murmansk on Russia’s northern coastline. While the voyage north had often been a bone-jarring experience as we smashed our way through the ice, the homeward leg was a much more sedate affair. The wake of broken pack ice that we’d left behind was now at times a mile wide and the process of sailing ‘downhill’ the way we came was a positively sedate affair by comparison. From time to time we slowed down to watch polar bears out on the ice, or the occasional ringed seal and we even saw a pod of walrus as we approached Franz Josef Land. But for anyone thinking that we were on a pleasure cruise there were several reminders that we were on a working nuclear surface vessel, including being buzzed by Norwegian military aircraft and being warned from passing too close to the Novaya Zemlya archipelago, where rocket testing made this route ‘dangerous to shipping’. We’d also been told by Moscow that we weren’t allowed to arrive at the Pole before 15th July, which seemed a bit odd as the Geographic North Pole – frozen wasteland or not frozen wasteland – is in international waters. I mentioned this to one of the Russian officers who corrected me very politely, informing me that we were on a Russian ship and if Moscow tells us not to go somewhere, for whatever reason, like it or not, we’re not going there. The original Russian nuclear icebreaker: whatever happened to Lenin? If 50 Years of Victory is the most recent, state-of-the-art nuclear icebreaker, then it owes much to the very first of all, the NS Lenin. Launched in 1957 Lenin was both the world’s first nuclear powered surface ship and the first nuclear powered civilian vessel. According to Soviet-born features editor of Engineering & Technology magazine, Vitali Vitaliev, it was: ‘the greatest ship in the world – a masterpiece of Russian engineering. As children we had pictures of it on our bedroom walls.’ It also featured on Russian postage stamps. Lenin was decommissioned in 1989 because she was literally worn out. Years of crashing through the Arctic pack ice had worn the hull thin, and as a result she was laid up at Atomflot in Murmansk, where she was converted into a museum ship that opened in 2005. Lenin is held in such affection in Russia that when I visited in July earlier this year there were several wedding parties queuing up to have their official nuptial photographs taken in front of this imposing vessel. On board, the technology looks very similar at first glance to that on 50 Years of Victory. And while there are obviously fewer computers and more mechanical dials and levers on view, the real difference is in the officers’ quarters, the mess rooms and the wardrooms. These are all exquisitely decked out with Art-Deco style interiors. While 50 Years of Victory is all about form and function, with its utilitarian magnolia paint and rudimentary furnishings, Lenin is simply opulent. With wooden paneling and brass everywhere, it resembles a floating palace more than a working icebreaker. The Party obviously knew how to look after itself. But Lenin had a chequered operational history and was involved in two nuclear accidents. And while these happened in the mid-1960s, they did not become widely known until after the fall of the Soviet Union. In February 1965, after shutting down for refueling, fuel elements melted inside No2 reactor as a result of the coolant being prematurely removed. More than half of the fuel assemblies fused on to the reactor core, resulting in the need to remove of the fuel unit for disposal. The entire assembly was taken away, quarantined in a special cask and stored for two years before being dumped in Tsivolki Bay (near the Novaya Zemlya archipelago) in 1967. Later that year a cooling system leak happened shortly after refueling. In order to locate the leak engineers needed to smash through the reactor’s concrete casing. They did this manually with old-fashioned sledgehammers and in doing so caused irreparable damage to the casing. As a result all three OK-150 reactors were rendered unserviceable and were subsequently replaced with two OK-900 reactors in an operation completed in early 1970. These two reactors provided steam for four turbines that in turn powered Lenin’s three sets of electric motors. 50 Years of Victory is one of six Arktika class icebreakers operated by the Rosatomflot (Russian Atomic Fleet) of Murmansk on behalf of the Russian Government (the others are Arktica, Sibir, Rossiya, Sovietskiy Soyuz, and Yamal.) The ship’s name commemorates the defeat of the Nazi forces invading Russia on the Eastern Front during the Second World War. The keel was laid on 4th October 1989 in St Petersburg and the Victory was launched on 29th December 1993. After a prolonged fitting out – delayed by financial restrictions in Russia following the fall of Communism – the icebreaker finally came into service on 23rd March 2007. Engineering & Technology magazine joined the Victory for only its second commercial passenger voyage to the Geographic North Pole. The curtains pull back to reveal the true scale what it takes to build a long-range solar-powered aircraft. Bertrand Piccard and André Borschberg, the two main pilots of the Solar Impulse HB-SIA aircraft, embrace; thumbs up signs are given, arms held aloft. Meanwhile the curtains are still retracting to the walls of a hangar that could easily house a commercial passenger airliner. The wings go on forever. And they need to: not only are they there to provide the as much lift as possible, they also provide the largest possible surface on which the solar panels that will power the aircraft are mounted. Every spare centimetre is covered. To save weight the fuselage has been designed to be minuscule relative to the wingspan, hardly bigger than a conventional glider. Make no mistake: Solar Impulse HB-SIA is a huge presence. And it’s not even the size of the aircraft that the team will use to fly around the world using nothing but the power of the sun. During Piccard’s presentation, fact after startling fact emerges. With the wingspan of a Boeing 747-400, the Solar Impulse aeroplane weighs less than an average family car (1,600kg). Close to 12,000 wing-mounted solar panels supply renewable energy to four electric motor gondolas that propel the plane. During the day these panels will also charge the lithium-polymer batteries that will supply power for the night-phase of Solar Impulse’s flight. With the batteries weighing in at 400kg – a quarter of the plane’s total weight – getting the balance right has been one of the key challenges in developing the aircraft. Piccard explained that the HB-SIA is the first prototype in the Solar Impulse project. In order to save weight and space, the aircraft’s cabin is unpressurised (restricting the maximum height to 8,500m), and this is where the test pilots will assess the feasibility of a complete day-night-day flight over 36 hours, propelled only by electricity generated on board by solar power technology. After fine-tuning, the aircraft is scheduled to make the first of a series of three types of test flights before the end of the year, cumulating in a maiden night flight in Switzerland in 2010. The prototype has three main objectives. The first is to validate the results of the computer simulations and materials selection decisions. The flight will see how the aircraft performs in real life. Attaining a 63m wingspan with the necessary rigidity, lightness and flight controllability with just 1,600kg take-off weight is an aeronautical challenge that has never been achieved to date. And the flight will show how efficient the energy capture and storage system really is. The results from the test flights will be fed into specification changes for the second aircraft – the HB-SIB – that will carry out the actual project mission of circumnavigating the world in five stages, each lasting several days, in 2012. Bertrand Piccard is one of the great explorers of the modern era, perhaps most famous for the first ever non-stop circumnavigation of the globe by balloon. Accompanied by aeronaut Brian Jones, Piccard’s Breitling Orbiter 3 landed in Egypt after a 45,755 km flight lasting 19 days, 21 hours and 47 minutes, prompting the pilots to co-write the best-selling book ‘Around the World in 20 Days’. But it could have all gone so badly wrong. It was the realisation that the whole project could have been scuppered by lack of fuel that drove him to attempt a further circumnavigation flight – only this time without the use of fossil fuel or its attendant polluting emissions. Solar Impulse was born. At the unveiling of the aircraft the Solar Impulse company hosted a display of some of the components, materials and electronics that went into making the HB-SIA. These include carbon fibre structural pieces such as the wing ribs that give the aerodynamic profile. Despite being so light they can be easily lifted with just your little finger, perhaps the most interesting item is a cockpit instrumentation panel that is effectively a power status summary indicator. Parameters such as rpm and temperature are clearly shown for the four wing-mounted engines, but there is also a series of slider bars that show the condition of batteries or energy accumulators. The batteries are, of course, crucial to the success of the circumnavigation because this is where the surplus energy generated during the day will be stored to power the night-time flying. Beneath the wings are four gondolas, each containing a 10HP motor, a lithium-polymer battery set and a management system controlling charge/discharge and temperature (represented in the cockpit on the instrument display). The thermal insulation has been designed to conserve the heat radiated by the batteries and to keep them functioning despite the outside air temperature of -40C at 8,500m (roughly the height of Mount Everest). Each engine is fitted with a reducer that limits the rotation of each of the 3.5m diameter, twin-bladed propeller to within the range of 200-4,000rpm (another parameter displayed inside the cockpit). The energy is gathered by 11,628 monocrystalline silicon cells plastered all over the upper surfaces of the wings and horizontal stabiliser at the rear of the plane. Each cell is 150 microns thick, and has been selected for its light-weight and flexibility. But not, it would seem, for its efficiency. At 22 per cent, the Solar Impulse technical documentation is first to admit, these are nowhere near the most efficient available, but the additional weight required to improve efficiency would have thrown out the mathematical balancing act and the less efficient option won out on other considerations. The designers say that the maximum energy density for the aircraft prototype is 220Wh/kg and only the test flights will be able to provide clues as to whether this needs to be improved upon. There is only a relatively small part of the day when the solar panels are illuminated at such an angle that they are operating at full efficiency. At midday, each square metre of the wing surface receives the equivalent of 1,000 watts of light power. Over the course of a day this averages out at just 250W/m 2. With 200m2 of photovoltaic cells and with 12 per cent total efficiency of the propulsion chain, the aircraft’s engines achieve, even after extreme optimisation of the energy chain, an average of just 8 HP, which is about the same power as a 50cc motorcycle. Or, in aeronautical terms, roughly the same amount of power the Wright brothers had available to them in 1903 when they made their first powered flight. The difference is that Solar Impulse is generating its own power on board from renewable resources. Energy management aside, one of the most critical developments has been the electronic instrumentation panel in the cockpit. This allows the pilot to monitor the condition of the flight in two key parameters – ‘bank-angle’ and ‘side-slip’. The Omega instrument panel was the brainchild of Claude Nicollier, former European Space Agency (ESA) astronaut, with four space flights under his belt as well as an eight-hour EVA (spacewalk) to his name. Nicollier also sits on the Swatch Group board of directors that has provided financial assistance for the project, as well as the technical expertise to develop a performance simulation and testing system for the aeroplane’s propulsion chain. Omega already had the technical experience in the field of hybrid propulsion, but, more importantly, was in a position to align its own reputation for engineering excellence in the field of high-end horology with an environmentally friendly sustainable energy project. Second, because of Solar Impulse’s large wing-span to length of fuselage ratio, there is the tendency to pronounced sideslip, an error where the plane drifts off course relative to the direction in which it is pointing – in other words, it won’t go in the direction it’s being steered. Nicollier, who will be taking part in the later phases of the test flights, says that in the early simulator runs there was sideslip of up to 15 degrees, “which means that, because you are flying pretty slowly, as you approach a runway, you will not immediately be able to figure out which direction the aeroplane’s flying.” To indicate sideslip, Nicollier has devised an array of blue LEDs with a green light superimposed that tells the pilot at a glance whether he is good to land. The wider environmental implications of a flagship technical challenge such as Solar Impulse is largely symbolic, giving bodies such as the European Commission a platform to display their green credentials. And there’s no doubt that Bertrand Piccard has made the most of the opportunity to display technology as a force for environmental sustainability. Piccard and Borschberg are travelling the world spreading the word. At the Beijing Olympics they presented Solar Impulse, and they have taken models to India and the UAE. Along the way they have been helped by a group of high profile ambassadors, including Prince Albert II of Monaco, Buzz Aldrin, Yann Arthus-Bertrand, Paulo Coelho and Al Gore. 1999 – Birth of an idea. Idea of Solar Impulse comes to Bertrand Piccard as his first round-the-world balloon flight nearly fails due to lack of fuel. 2001-2003 ­– Scientific support. Piccard scours world researching solar power technology and meeting solar aviation specialists. Teams up with André Borschberg. Ecole Polytechnique Fédérale de Lausanne (EPFL) agrees to conduct feasibility study. 2004 – Birth of a company. Solar Impulse SA is founded on 29 June 2004. Core technology team assembled and scientific partnership agreements are signed with EPFL, the European Space Agency (ESA) and Dassault Aviation. Dassault commit to review design of Solar Impulse while providing expertise in fields of aeroelasticity and flight commands, safety and systems reliability. 2004-2007 – Project start-up. Private asset management company Semper become first official supporter, while Belgian industrial group Solvay join as first main partner, providing innovative materials, modelling and simulation. Altran join as engineering partner offering project and risk management as well as aerospace expertise. May 2006 Swiss watch manufacturer Omega join team bringing with them technical expertise of former ESA astronaut Claude Nicollier, who develops instrumentation crucial to landing the plane. Feasibility study confirms that an aeroplane with large wingspan and high aerodynamic efficiency is possible. 2007 – Growing wings. After 4 years of research, Piccard and Borschberg present the final design of the first prototype, HB-SIA. Virtual flight mission in May confirms that the battery arrays can store sufficient energy to run engines all night. Pilot training starts. 2008-2009 – Construction assembly tests. Assembly of cockpit and tail boom begin in September 2008. Central wingspar is made from three rectangular carbon fibre and honeycomb sandwich beams laid end-to-end, totalling 63 metres. Vibration tests confirm that modulus of elasticity is lower than expected; meaning that structural rigidity of Solar Impulse is stronger than expected. 2010-2012 – Flight of tomorrow. After six years of design, calculations, simulation and construction the HB-SIB will embark on night flight tests, culminating in the first circumnavigation of the globe by a solar powered aeroplane. If you’re a scientist and want to sell books then you’ve got to write about God. Francis Collins, head of the Human Genome Project, and as such probably one of the world’s leading scientists of the day, is happy to oblige. A committed former atheist, some time agnostic, but now member of what we broadly think of as the Anglican Church, Collins has come up with a compelling rationale for why religious belief and Big Science are not mutually incompatible. While it is very tempting to see the hand of the publisher guiding Collins toward simply writing a rebuttal of Richard Dawkins’s splenetic ‘The God Delusion’, Collins has actually got something interesting to say about compatibility issues between the world of objective technological reality and the less observable world of matters spiritual. While it’s true that he’s openly scornful of Dawkins – dismissing some of the British scientist’s claims as ‘eye-popping’ – his agenda has more to do with unification and harmony of differing approaches to thinking, which is one of the main attractions of ‘The Language of God’. Whether or not ‘The Language of God’ is sufficient to silence the hordes of aggressive atheists rallying to Dawkins’ flag is moot. Of course, it all comes down to faith, and faith, unlike science, does not require evidence. For Collins, this explains why many scientists are uncomfortable with an argument where something more nebulous replaces data. On the other hand, recent research reveals that 40 per cent of all scientists believed in a god of some sort, Albert Einstein, Charles Darwin and Stephen Hawking among them. One thing I know is that, for sheer clarity of argument and magnanimity of thought, this important book knocks Dawkins’s ‘The God Delusion’ into a cocked hat. Sitting in his expedition headquarters in Leadenhall Street in London’s financial district, Arctic explorer Pen Hadow is at the centre of operations of his latest mission. His Catlin Arctic Survey is about to head off to the Arctic – hauling their own bodyweight of monitoring equipment across the ice – to do something satellites and submarines can’t. Existing satellite technology is able to measure the thickness of the ‘freeboard’ – the combined depth of ice and snow above sea level. The presence of snow is not relevant in the prediction of ice meltdown, but it does have a nasty habit of contaminating remote telemetry measurements. This is because radar cannot differentiate between the two, and so we can’t tell how much snow is depressing the ice cover. As the end reading is an extrapolation based on the assumption that the freeboard represents only one-ninth of the total ice thickness, any errors caused by snow become magnified to produce wildly inaccurate results. Submarine-based surveys are better at estimating the ice thickness, because their onboard technology measures the much larger draft of the ice. But even extrapolations based on these readings aren’t accurate enough. And, besides there’s hardly any submarine data available. So, it’s back to people hauling instruments on sleds in scenes that have not changed much since the Heroic Age of Antarctic Exploration, when the likes of Ernest Shackleton and Robert Falcon Scott were gunning for the South Pole. Hadow’s business card says director and head of surveying, and it’s been his full-time job since he drew a line under his high-profile 2003 expedition, when he became the best-known polar explorer of his generation. That year, he became the first person to walk solo and unsupported to the North Pole, then regarded by the polar community as the last of the classic uncompleted challenges. A shadow was cast over his success at the pole by a media controversy that inaccurately depicted Hadow’s delayed scheduled airlift from the pole as a ‘rescue’. For Hadow, the 2003 expedition was an eye-opener. In all his years exploring the north polar icecap, never before had the explorer seen so much thin ice and open water in the Arctic. “To travel my route in a straight line to the pole – 478 miles as the crow flies – I found myself needing an amphibious option.” Hadow equipped himself with an immersion suit and, in order to keep the route as short and straight as possible, when he encountered water he simply swam across it. During the course of his research for his book Solo, his account of the 2003 trip to the pole, Hadow “started to better understand the process that was bringing about this increased open water and sea ice: global warming”. He also discovered that there was one critical data set that scientists did not have if they wanted to predict when the ice cover on the Arctic Ocean would disappear more accurately. Although going solo is something Hadow is used to, there is simply too much work to be done on this trip to go it alone. To assist him he has enlisted the help of two fellow explorers, Ann Daniels and Martin Hartley. Daniels is in charge of field operations – handling navigation and other logistics – while Hartley is the expedition photographer and filmmaker. Hadow will pull the sledge containing the radar equipment and computers. Apart from the ice-thickness readings, the on-ice team will conduct 50 different sets of measurements and samples, from the water column, the ice sheet and the atmosphere. Some devices will record the data continuously; other measurements will be taken hourly, daily or weekly. Getting across the ice is hard enough without having to do the science as well. “It’s going to be hard work,” says Hadow. Much of the scientific and communications equipment the explorers will be using has been developed specially for the survey, with more data – including audio, video and biotelemetry – being transmitted than on any other polar expedition before. Taking up the most room and perhaps most important to the expedition is ‘Sprite’. The name is short for “surface penetrating radar for ice thickness establishment”, but Hadow says the name also doffs its cap to the Scott Polar Research Institute, one of the science partners that has played an influential role in the survey. Not surprisingly, Sprite is robust. The team will drag it across fields of rubble and send it tumbling down pressure ridges over a total distance of more than 1000km. The impulse radar unit is a mere 4kg – 25 times lighter than equivalent radar systems used in aircraft surveys. It is mounted behind the survey’s sledge boat, effectively converting the sledge into a survey vessel, called the Lady Herbert, after the wife of one of the greatest polar surveyors ever, Sir Wally Herbert. Built by Cambridge-based scientist Michael Gorman, Sprite will take a high-resolution cross-profile of the snow and ice every 10cm along the route. Sprite’s own computer will then process the raw data before transferring it to the central data unit, otherwise known as the ‘onboard sledge computer’. Here the data is compressed and sent using the Iridium network of orbiting communications satellites back to the survey HQ. There it will be reformatted and distributed to the Survey’s science partners. Iridium is the only satellite network available in the Arctic and but explorers do not much like it. It’s narrow bandwidth channels result in a low data-transmission rate. The sledge computer, developed by Andrew Jackson, has to use a custom-built multi-modem data uplink system that can receive, format, store, compress and transmit the data back to the UK on a live, ‘delayed live’ or overnight basis. While out on the ice, the team will be communicating with each other, and the UK HQ, using a three-way person-to-person communications system developed by IET member and independent engineering consultant Perran Newman. Designed especially for the survey, the rig consists of an ear-mounted, jawbone-sensing headset and separate throat microphone, connected through a wiring harness built into the sledging suit, to a belt-mounted control box. Team members’ control boxes are networked via radio links to allow three-way voice communications. The boxes are also linked to a radio-transceiver mounted on the Lady Herbert, containing the uplink facility to the Iridium array. Toggling between control box functions is by push-button, meaning that the explorers won’t have to risk frostbite by uncovering their hands to operate the system. Other features include voice-activation, and a ‘live commentary’ link that will allow armchair explorers to follow the expedition on the survey’s website. The explorers will also be wearing a chest-belt with integrated biosensors that will measure and record physiological data such as heart rate, respiration rate, skin temperature and body orientation. Developed by Hildago, the Equivital system has been adapted from telehealth applications aimed at first responders and paramedics. Its use on the Catlin Arctic survey will provide an opportunity to assess how the body responds in the polar environment. Team members will also be taking ‘tablets’ that contain miniature temperature sensors, batteries and radio transmitters that will transmit information about their core temperature, as the pill negotiates its way through the stomach and the intestines. By linking reportage-style web-cam footage and live audio commentaries to data generated from body-worn bio-monitors it will be possible to not just follow the team’s progress but to experience it too. Anyone passing the survey’s HQ in Leadenhall Street should watch out for the huge screens Hadow is planning to put in the windows of the offices donated to him by his main sponsor. Those in the City worrying about the economic climate will over their lunchtime lattes also have the opportunity to worry about the real climate. Unlike so many modern adventures into the Polar Regions, the Catlin Arctic Survey has a real scientific mission as its main objective, and has more in common with the polar exploration of the Heroic age than any other recent expedition. This small team of explorers is going out onto the ice at great personal risk to themselves because there is no other way of getting the data. If they succeed, everyone on the planet stands to benefit. “There are times when I feel quite overburdened by the significance of the survey, and there are others when I just want to get on with it”, says Hadow. But there is a very strong sense in which the real work won’t really start until they return. As Hadow says: “Were just the foot soldiers getting out into the field collecting the information that the scientists need to do their work.” And with the Arctic Ocean and surrounding High Arctic environment more responsive to climate change than most, the urgency for the Catlin Arctic Survey to get out there and do just that is greater than ever. The UN Intergovernmental Panel on Climate Change (IPCC) thinks that seasonal disappearance of the Arctic Ocean’s sea ice will occur between 2050-2100. This is based on the best figures for the rate of the shrinking surface area and the IPCC’s long-range global climate forecasts. As if this weren’t scary enough, a super-computer model developed by the US Navy’s Department of Oceanography puts the meltdown date at within five years. Their calculations are based on the ice thickness estimates (as compared with surface area). As Hadow says though, the accuracy of the models are merely a function of the quality of the data relied on. The data returned by the Catlin Arctic Survey will “allow for the re-evaluation of satellite and submarine digitised observations. Climate Change modelers will be able to use the findings emerging from the survey to assist in validating or modifying projections made by the IPCC’s Climate Change 2007: The Physical Science Basis report. The survey data can be factored into related areas of scientific work that until now had been based on satellite and submarine data, but unverified by a ground-truth survey. Evidence for an earlier meltdown date than the IPCC’s – the most frequently cited and widely accepted – would mean that the environment lobby could apply more pressure on governments to take sustainable and responsible management of the environment more seriously. When it comes to Global Warming international agreements are the only route to success. But agreements can only be made if scientists can provide policy makers with higher-resolution forecasts than they already possess. * Scientists have major concerns about 15 cities across the globe, 13 of which lie in coastal plains. If current warming trends continue London, Bangkok, Alexandria and New York will end up below sea level, displacing tens of millions and causing worldwide economic damage if adequate flood protection measures are not put in place. * Large numbers of people living along the coast in South and East Asia (as well as in West Africa and the Caribbean) are at risk of losing their homes and their livelihood. * Sea levels are rising in the Bay of Bengal affecting villages in Orissa’s coastal Kendrapara district in western India. * Between 15 and 20 per cent of Bangladesh lies within one metre of sea level. Predicted rises in sea level will affect between 13 and 30 million people, potentially reducing rice production by 50 per cent. * Concerns are mounting in Shanghai, China’s economic capital, as the northern Pacific Ocean could rise by 7000mm before 2050. This impact will be exaggerated by the fact that Shanghai is sinking due to exploitation of groundwater needed to supply the population of 18million. * Maize production levels could plummet by as much as 25-50 per cent in the next 50 years in countries such as Brazil, Nigeria, Mexico, South Africa and Tanzania due to rising temperatures and shifting rainfall pattern. We’re looking at a fairly innocuous electronic component that could be straight out of a Radio Spares catalogue. But to Christophe Berthaud, head of Olympic timing at Swiss-based watch manufacturer Omega, it is at the heart of an infrared system he’s installed at the Whistler Sliding Centre, the site of the bobsleigh, luge and skeleton competitions for the 2010 Winter Olympics to be held in Vancouver, Canada. This high-performance, world-class sliding sports venue includes a 1,450m-long competition track, as well as the usual Olympic village buildings. Whistler is nestled in the beautiful Fitzsimmons valley on the southeast slope of Blackcomb Mountain in British Columbia. Its centrepiece is the horseshoe-shaped competition track that may look benign on television, but is terrifying up close. The athletes are barely visible as they whistle past at up to 90mph (140kph). Along the track there are 42 pairs of infrared emitters and receivers that send a time-tagged message along a wire to a central computer in the onsite control/timing tower each time the light beam is broken. There are two systems working in parallel – a master and a backup – placed exactly 1cm apart. The instrumentation receiving and processing the data for both systems sit in a 19in rack. The system looks remarkably straightforward, and anyone expecting to see sci-fi pioneering technology will be sorely disappointed. But the simple infrared sensors will track the progress of luge and bobsleigh competitors in real-time to the precision of a hundredth of a second. The systems used in the Olympics can resolve to the millisecond, but they don’t use that resolution in most events because the committee felt that such tiny differences were beyond the reliability of the technology. At a hundredth of a second, you can award a gold medal with confidence. “What is important in terms of technology is that we never bring anything new to the Olympics,” Berthaud says, describing the evolutionary process of developing and installing new timing systems for the 2010 Winter Olympics. “If a technology is used for the first time in the Olympics, it is not when it is new. Berthaud, an engineer by education, has spent more than 20 years working with Olympic timing technology. He knows the six-year rhythms of integrating new electronic systems into the mix. The key is to deliver something better, more accurate, faster and more appealing to the public while maintaining infallibility. With an estimated three billion viewers expected to switch on during the course of the Games, the key issue is reliability and the system testing starts in earnest a year earlier. In a way, the engineers at Omega have made a rod for their own backs with new innovations such as the photofinish, synchronized on-screen timing, split times and a host of other technical achievements over successive Games. Sports showcases rely on the integrity of their measuring and timing systems as much as they rely on their ability to broadcast evermore sophisticated programming to keep the punters hooked. Today’s systems are light years away from the early days when synchronised chronographs simply recorded the time the skier started and finished his run and the results were pinned to a notice board several hours later. One of the systems that Omega is bringing to the 2010 Games is a new timer designed for the alpine skiing event. Called Chronos, it’s a new generation of timer with a new clock and software. Chronos was developed last year, tested at the end of last season and tested again at the start of this season. It’s being trialled at the World Championship at Val d’Isère where it is being used as a back-up system during the races and the main system during the training. As the countdown progresses toward the opening ceremony on 12 February 2010, Omega’s technologists are actively involved in preparations for the competition where, for the 24th time, the Swiss watch manufacturer will serve as official timekeepers at the Olympic Games. On 12 March, they will play the same role at the Paralympic Games. At Omega’s first timekeeping assignment for the 1936 Games in Garmisch-Partenkirchen, Germany, a lone technician used 27stopwatches to time each event. Seventy years later in Turin, Italy, Omega deployed 208 professionals – 127 timekeepers and 81 data handlers – with 220 tonnes of equipment. Those numbers will be blown away in 2010 as the company mobilises the largest timekeeping contingent ever in winter sport. The technological dream, he says, is to develop systems that can become independent of the judges. At the Beijing Olympics in 2008,Omega installed a camera with a capacity for taking 2,000 frames per second. “There were two instances where a decision was made on the basis of precision down to one pixel,” says Berthaud. In the bobsleigh event, the competitor starts and stops the chronometer by passing through light beams. With these systems “no one can make a contestation. You can have a cell that doesn’t work, but there is no human judgement”, explains Berthaud. I’ve spent four days touring sites including a snowboarding test at Cypress. But Berthaud is on a tight schedule. There is time for one last question. I ask him what will keep him awake the night before the Games. “Nothing. The Olympic Games is six years in preparation so if the day before the games start you don’t sleep then you’ve done something seriously wrong.” I check the time on my recorder. We’ve spoken for 14 minutes, 29 seconds.